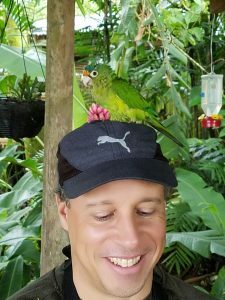 Originally from Niagara Falls, New York, Patrick is a writer and birding guide who has worked in the travel and tourism industry from the cataracts of Niagara to the Peruvian Amazon. 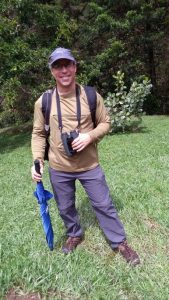 A serious birder since the age of 7, this passion has led him to Mexico, Ecuador, Peru, Bolivia, Panama, the Dominican Republic, Thailand, and his current place of residence- Costa Rica. A biologist and systematist by training, Pat has worked on research projects in Colorado, New York, Wyoming, and Washington as well as in Peru. When not looking for birds in Costa Rica, he spends time with his daughter and attempts to practice Chinese martial arts. in case you haven’t been it… Kricher’s The NEW Tropical Companion is awesome. Fully illustrated with great photos from all over the neotropics. I just downloaded your guide. I’m already planning to visit some of the sites you present that are new to me. I would like to introduce myself, I am Gil Gutglick and I’m the founder of Wunderbird, a new brand, that was established in 2016 and is now in the process of joining the world wide birding community. Wunderbird came into creation after extensive research into the true nature of bird watching and birding which lead us to develop the first ever clothing collection that is totally dedicated to the birding experience and the birdwatchers needs. I’m writing to you because I think it would be fantastic if you would like to try our products and post an unbiased review on your blog. Looking forward to hearing back from you and if you are willing, let me know which of our products would best suit you, what size/sizes you would like to receive, use and review as well as sending me your mailing address and phone number so that I can arrange the shipment. Have paid for your book, now how do I access it? Will be leaving for Costa Rica on 7/13. You were recommended to us by a fellow Webster Groves Nature Study Society Member, Hugh Nourse. We have a 15yo son who has been serious about birding for several years and we hope to make the most of our trip. The first week is with EF Tours, primarily in the Guanacaste region. The following week we will be in Samara, in a Spanish immersion program, but expect to be able to skip out for the day if we decide to. Is there a chance we could meet up? What do you recommend? Well, we’re all booked for our next trip to Costa Rica. I think it’s our sixth time… and, thanks to you, we will finally get to El Tapir and Quebrada Gonzalez. Are you available to be our guide there on January 23rd? We’re staying near Guápiles at Casa Rio Blanco. Thanks for all the help over the years, and for your excellent new guidebook. @David- I appreciate your kind words, yes, I should be able to guide you that day. I will email you.